With her clinic in Ballindine in County Mayo, holistic therapist Marian Trench has been expertly trained in all aspects of Bio Energy healing and Reiki. Marian has the ability to diagnosis and treat a wide variety of serious physical and psychological conditions. Marian holds clinics in Ballindine, County Mayo. She is passionate about people and their journey of discovery to healing & wholeness within themselves and thus their own lives. In Marian's Bio Energy healing clinics her primary objective is to identify any energy disturbances by using a series of particular hand movements to scan the energy field within and around your body. Once Marian has identified and localised the energy blockages and imbalances she then begins to release these blockages by using another series of hand movements. This allows the life energy to flow freely throughout your body. This energy through its' own intelligence resonates through to the very core of our being and so unlocking our inner healing abilities that are dormant within each cell in our body. As the treatment is being carried out you may experience a sensation of heat, some tingling, coolness, or perhaps even a pulling sensation. These sensations are just the subjective elements of the deep energy balancing and the release that is happening. After second or third day of bio-energy sessions you may begin to experience this cleansing and release as though your condition or illness was getting worse. In fact, this is not a negative development, in fact it is good, and it is a vital part of the Bio Energy healing process and any short term worsening of your symptoms normally presages a return of your full health. During the Bioenergy Healing session treatment Marian will go into greater detail including any necessary measures to be taken particularly with regard to your diet, exercise, rest and positive attitude amongst other elements. At the end of your treatment, you will be fully aware of what is needed in order to regain the full health which is rightfully yours. Most importantly Bioenergy healing therapists such as Marian will encourage you to take control and responsibility for your own life and well-being. This will bring about a very important sense of self-empowerment. It is recommended that Bio Energy Healing treatment is carried out over four consecutive days at first with each healing therapy session lasting approximately 60 minutes. 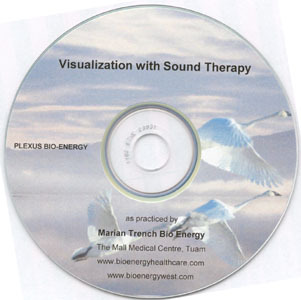 Marian's bioenergy healing sessions normally takes place on a one-to-one basis in a private and relaxed environment using a background of carefully chosen music that, over the years, Marian has found to enhance the treatment. From her experience of treating ill children Marian has learned that very often the child may be absorbing the, very understandable, stress that the parent or guardian is experiencing. Consequently Marian generally recommends that she works on both the child and the parent, and this is usually the mother. Once the parents' energy is balanced and is flowing freely this aids and speeds up the Bio Energy Healing of the child. It is not unusual for children undergoing the treatment to fall asleep mid-session.